October 15 @ 12:30 p.m.
We have a special guest - Ann Haspels - to conduct our demo this month. 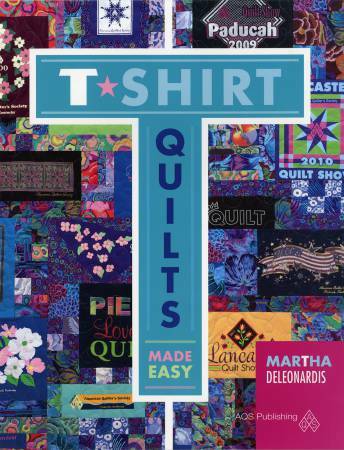 She's made numerous t-shirt quilts and will share her tips and tricks and demonstrate the best way to prep your t-shirts and turn them into a quilt. If you've made a t-shirt quilt, please bring it for show and tell. This month we will have the demo only one time - at 12:30 p.m. Third Thursday Demo is always free. Bring a friend! Just in time for fall, this cute table runner will brighten your kitchen or dining room or make a great hostess gift if you’re visiting family for Thanksgiving. 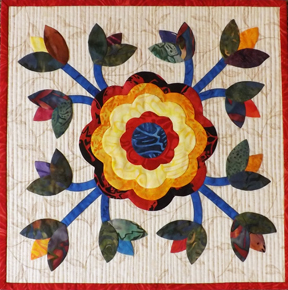 In this class, taught by Judy Bryan, you’ll learn basic piecing, raw edge applique, satin stitching applique for security (table runners do need to washed from time to time), and a little bit of freehand machine embroidery. Do the homework suggested (cutting lots of little orange squares and tracing the applique pieces onto fusible web) and you’ll most likely finish this project during class. Sign up today. Class limited to SIX students. If you’ve ever seen LaWana Ferrier’s hand applique work you know you’ll be learning from a master when you take this class. Shown here is one block she made and you can see two others at the shop. 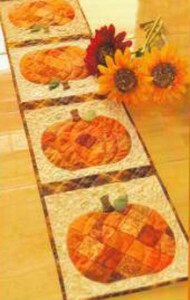 Choose any block from the popular Rose of Sharon book and you’ll be on your way to making a beautiful hand appliqued table runner, wall hanging, or quilt. LaWana will share her best technique tips so that you’ll feel confident using this method. We will be taking up to ten students in this class since sewing machines are not required and we’ll have more space in the classroom as a result. There are a couple of spaces available in our Wednesday afternoon youth class. The project is a trick-or-treat bag . . . just in time for the big day! Get the details here. We've been having such fun with our guest teachers this year. Many thanks to Peggie Buckholts, Ila Starks, Sine Skaggs, Patti Curtis, Beth Cardozo, and Bonnie Bobman who have all taught great classes for us. We're looking forward to having LaWana Ferrier, Elaine Brown, and Ila Starks (once again) teaching between now and the end of the year. Our 2016 class schedule is in the works. If you are interested in teaching at Cortez Quilt Company call Karen at 970-565-7541 or send an email outlining your idea for a class. Did you know that our local public radio station - KSJD - is now offering local new coverage? They are! It's great and about to get even better. Cortez Quilt Company has been underwriting the local news coverage during the initial launch period. This week, KSJD is hosting a membership drive to raise funds to further develop and grow their local news division. We're donating 20 gift certificates to the effort as an incentive to encourage you to become a KSJD member or renew your membership. This Wednesday, October 14 from 7 - 9 a.m. shop owner Karen Childress will be on the air and answering the pledge phone line at KSJD. If you're one of the first ten people to call with a pledge of $50 or more during each of those two hours you'll receive a $20 gift certificate to Cortez Quilt Company. So set your alarm, call in to support KSJD, and look forward to hearing more local news! becoming a dealer . . . THIS SATURDAY! 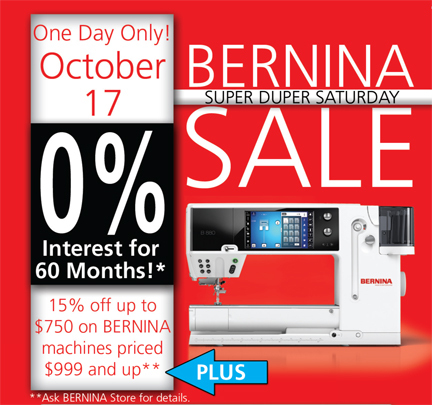 Save up to $750 on a new BERNINA. Since this is a one-day event we expect to be busy on Saturday. Saturday, that's fine, too. Thanks! 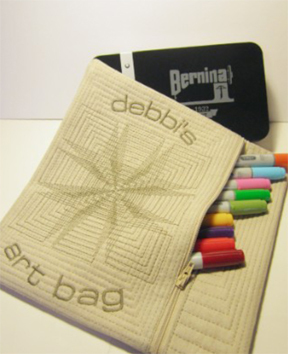 Time: 5:15 – 8:00 p.m.
Join us on Tuesday, October 13, for an excellent 45 minute presentation from BERNINA’s software expert, Debbi Lashbrook, explaining how to design a personalized in-the-hoop bag for storing supplies. We will begin with “show and tell” so bring any embroidered items you have been working on. Come watch the presentation if you want to learn about BERNINA Software 7 and if you already own the software, bring your laptop and stay to create the project. Don’t forget to bring a USB flash drive to receive a copy of handouts and designs. Please call 970-565-7541 or e-mail Cindy no later than Monday, October 12 at 6 p.m. to reserve your space. Get information on everything foot #21 will do and watch a short video here. Halloween Fabric is 25% Off! We have several of these cute panels left along with coordinating yardage. 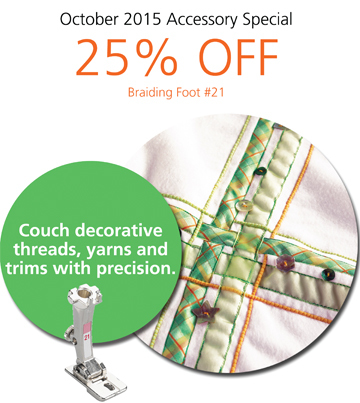 Come in this week to take advantage of 25% off. 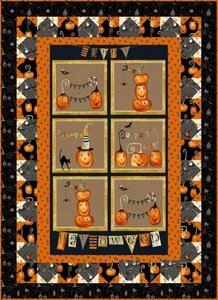 You still have three weeks until Halloween to whip us a wall hanging, throw quilt, pillowcases, or trick-or-treat bag for the little ones. Imagine that you've organized the rows for your quilt just perfectly, but you're not going to sew them together until tomorrow. You could pin little slips of paper to each row or you could do what Patti Curtis does . 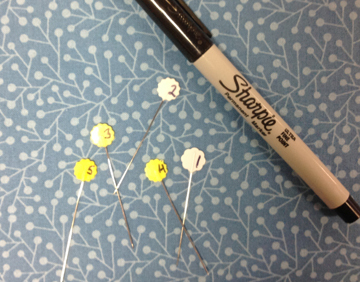 . . use a Sharpie to number flat-head pins. Make a set of these and store them where you can find them again and again. Great idea, Patti!